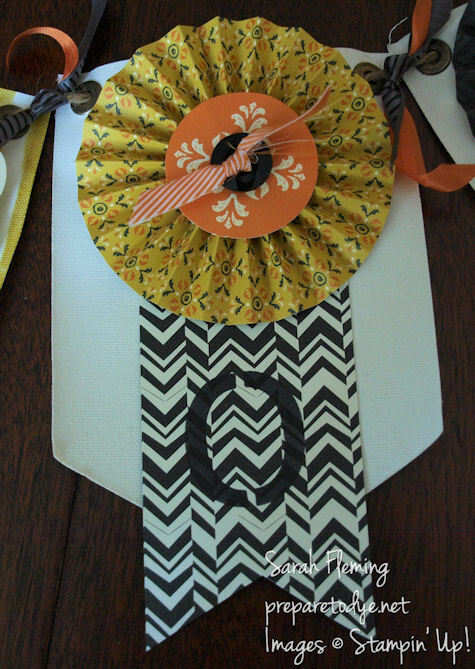 I am loving the Build a Banner Simply Created Kit Stampin’ Up! introduced in the Holiday Catalog. 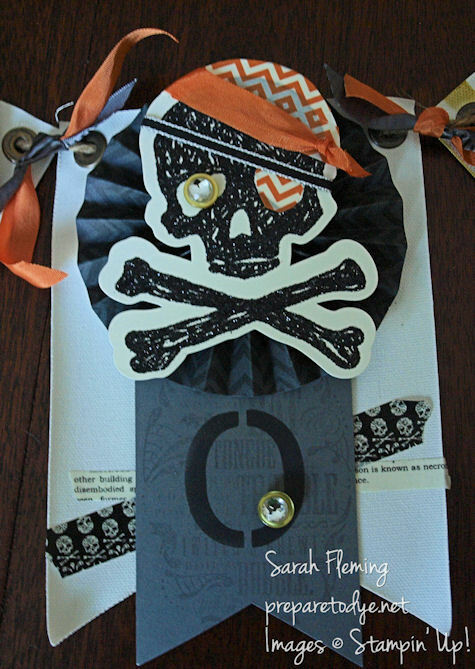 I recently held a class to make the “spooky” banner from the catalog sample that uses the Halloween Accessory Kit. But as I started making my sample to show my class participants, I really got into it, and my banner turned out a little different. And you can make yours however you want, too. Here are a few close-ups of the flags. The Halloween Accessory Kit comes with the pre-scored paper to make 4 rosettes, but I wanted rosettes on all 6 of my flags, so I made 2 more out of the Witches’ Brew paper. Love this paper. That ribbon is the Pumpkin Pie Chevron Ribbon — I just cut it in half lengthwise. I stamped the big stamp from the Toil & Trouble stamp set on the Basic Gray flag in the same color of ink. Just for extra texture. My favorite part of this flag (besides One-Eyed Willie) is the Witches’ Brew washi tape. I had so much fun making this banner (and another one that I made for a baby shower) that I’m already making plans for a “boo” banner and a “fall” banner and a “thankful” banner and a “merry” banner and… Well, you get the idea. 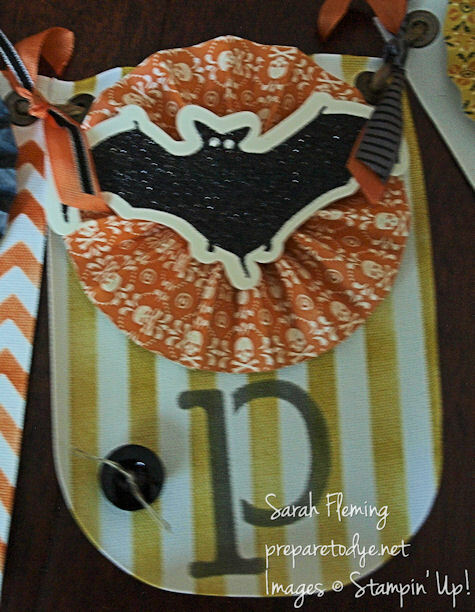 You can buy your Build a Banner Kit and the Halloween Accessory Kit in my online Stampin’ Up! store.